One summer day Pete Ricepudding took a sun-bath. He stared at the blue sky, with a blade of grass in his mouth. He thought about the vicar who says that God has made everything. He thought about his grandmother who says that we come and go like summer and winter, and that we are part of God ourselves. Suddenly the sun attracted his attention. How beautiful was his roundness! He looked about him, and saw an old wheel of a cart, which a farmer had left there some time ago. Now he was at once altogether awake. He jumped up and ran home. There he grabbled in the sewing-basket and found the long measuring-tape which his mother always used to measure how thick Pete's belly was. He ran back to the meadow where the wheel was patiently waiting for him. 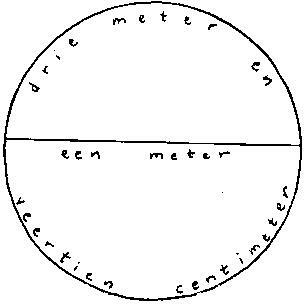 From the center of the wheel until the edge was exactly 50 centimeter, so from edge to edge through the center was exactly one metre. The edge itself was 3 metre and 14 centimetre all around. Pete scratched his head. It appeared to him that he already knew this number. It had something to do with round things, with ... circles. Now Pete sauntered home again, deep-thinking all the way, with his hands in his pockets. When he entered the house, he didn't see his mother. She looked after him, shaking her head. What was wrong with the boy? She saw that he laid the measuring-tape on the table, and that he took a thick book from the book-shelf that once belonged to his grandfather: "geometric problems". While turning over the leaves of the book, Pete found a chapter about circles, and suddenly there was a page where his number stood in thick print: 3.1415 ... (there came many more figures behind these five). The number was radiating from the page into his eyes, he greedily took it into his head. This was a very remarkable number, it even had a name: the name was "pi". So the wheel was all around 3 metre and 14 centimetre and another 1.5 millimetre and some more. How was it possible to measure or calculate it ? Now he put his grandfather's old hat on his head, and went back to the meadow to think it all over. He sat down in the grass, and this was what he thought: suppose there are no people at all, then nobody can measure the edge of a wheel all around, or the edge of the sun. Then nobody knows anything about that number pi that is equal to 3.1415 ... Then nobody can ever measure or calculate the number with ever more and more figures. Then pi would not exist at all. Or would it? First he thought that a number doesn't exist if nobody knows the figures of the number. Then he thought that the edge of a circle has a definite length, whether measurable or not. How was it possible that perfectly round things do exist, like the sun? But no, the sun is not perfectly circular, that is only appearance. It was pitch-dark when his mother found Pete, sitting in the grass and with grandfather's hat on his head. She was very concerned and gave him a coat to put on, and took him home.